I’m kind of a hoarder when it comes to amps. I’ve got many more than I need, but when I heard about this tiny, low-cost amp I couldn’t resist. At 45 watts, it’s only $150 and the size of a guitar pedal. Would it work as a good backup for a harp amp? 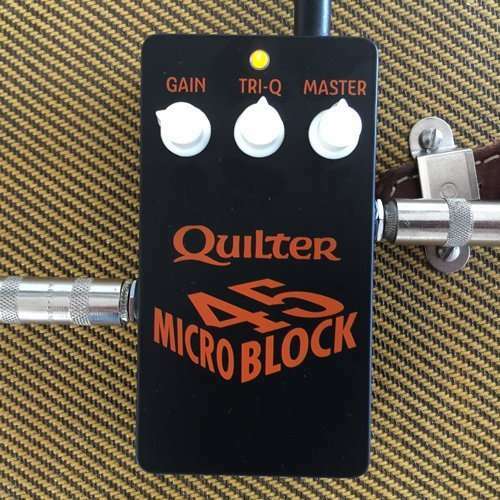 Picked up the Quilter Microblock 45 and made this video test. Of course it’s been recorded on an iPhone, and then uploaded to Vimeo, compressed, etc. Keep that in mind. And remember, even at $150, it’s only an amp head, you still need a cab to run it through, so the cost goes up if you don’t have a few lying around your house. Luckily, I do. The video compares the Quilter with a Mission Chicago 32-20 amp ($1400). Both the combo, and the cab I use with the Quilter are 2×10″, each containing 1 Eminence Legend, and 1 Eminence Lil’ Buddy. I also played the Quilter through a 1×12′ cab with a Cannibis Rex. I’m using a JT30 microphone with a ’49 Shure Black Label CR inside. See what you think.